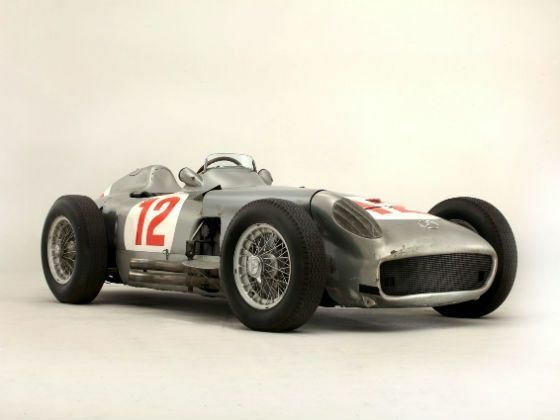 The Mercedes-Benz type W 196 R Grand Prix racing car, in which Formula 1 legend Juan Manuel Fangio won two races in his championship winning 1954 season, has been sold for a record breaking sum of 20.89 million Pounds (the highest ever for a car sold at an auction) which equals a whopping Rs 187.14 crore! As lot number 320 came up for auction at the Goodwood Festival of Speed Sale conducted by British auction house Bonhams, all present in the room knew that they would be experiencing special. The car in question was the Mercedes-Benz type W 196 R Grand Prix racing car, a thorough bred racing car piloted by the great Juan Manuel Fangio. There was no doubt that the car would fetch a fat sum but what went on in the minds of the many collectors was whether it would be able to break the record set by 1957 Ferrari 250 Testa Rossa. The Testa Rossa was sold for £10.76 million (Rs 97.19 crore) in 2011 at the Gooding auction in Monterey. So when the bidding started it was clear that the W 196 R was destined to set a new record but what will be the final amount was the only query left. And as the bidding came to a close, the Mercedes-Benz type W 196 R became the most expensive car to be ever sold as it was brought by an unidentified bidder for a mind boggling £17.5 million and after taxes and other costs, the final price stood at £20.89 million which equates to an eye-popping Rs 187.14 crore! This makes W 196 R the most expensive car to be sold in an auction and also the priciest Formula 1 and Mercedes-Benz car ever traded. Astonishingly, this is not the most expensive car to be ever purchased as that record belongs to a 1962 Ferrari 250 GTO which was brought by American billionaire Craig McCaw last year for £23.17 million or Rs 209.3 crore! One might be baffled on how a car can be sold for such a large sum of money but the car in reckoning is a special car with historic value and racing credentials. There are only 10 examples of the total 14 cars ever produced which are in existence and it was in the same car with chassis number 006/54 that Fangio won the German and Swiss GPs en route to his second World Championship title in 1954. Also, it was the same car with which Mercedes-Benz made a successful return to the world of Grand Prix. To add to its value, it’s the only post-war Silver Arrow in private ownership as six models belong to the Mercedes-Benz Classic collection, three vehicles are housed in museums in Turin, Vienna and Indianapolis. The Mercedes-Benz type W 196 R was far ahead of its time when it made its debut in 1954 and was powered by a 2.5-litre straight-eight engine which was employed to reduce the car's overall height. Also the W 196 R featured technologies like fuel-injection, all-independent suspension, lightweight tubular ‘spaceframe’ chassis and inboard brakes for better weight distribution making it one of the most advanced cars of its era and a yardstick for future Formula 1 cars. One more interesting trivia is that the W196 R originally had bodywork which enclosed all the wheels for better aerodynamics and it was Fangio himself who suggested to the Mercedes-Benz engineers that an open-wheeled version would be more apt for tighter race tracks.